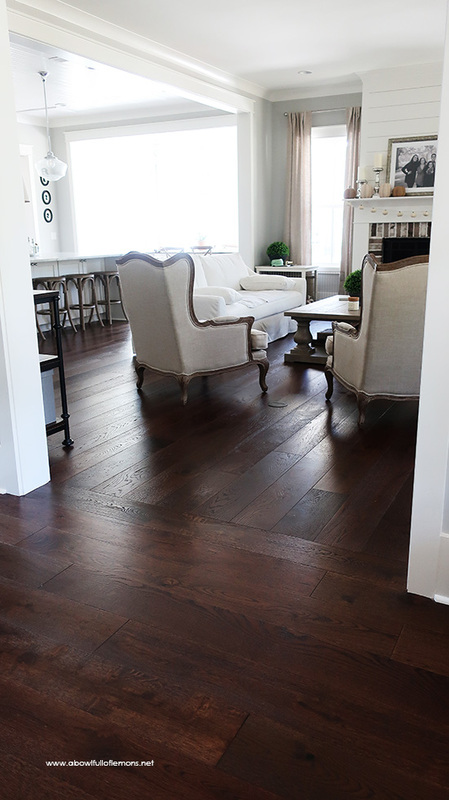 Last week, I shared our hardwood flooring choice (& installation) with you. Today, I’m going to reveal what it looks like installed in our brand new home (I’m in love). 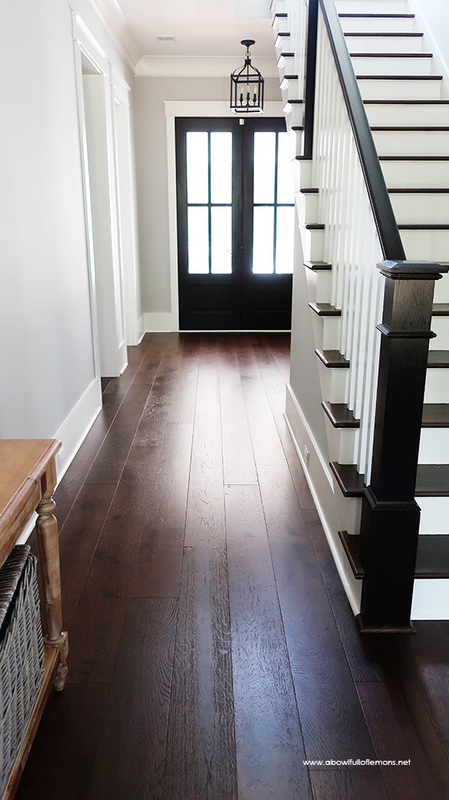 After a lot of research, we decided to go with Armstrong TimberBrushed Flooring. It has a classic and timeless look and it’s simply stunning in our home. 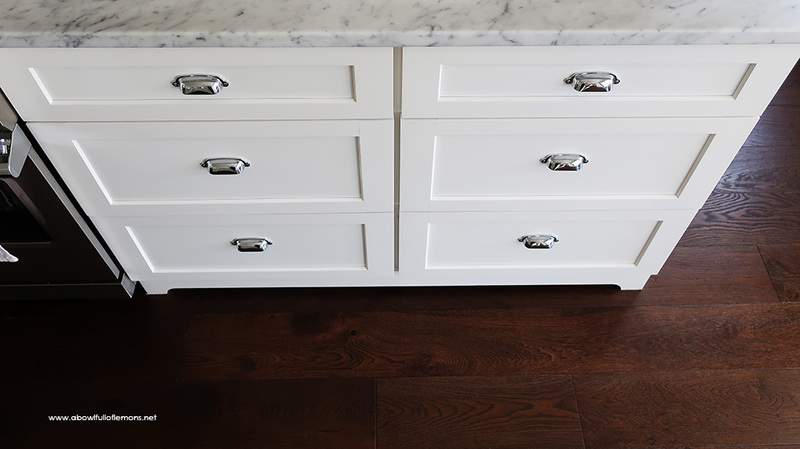 If you missed my flooring details on the last post, be sure to check it out here. I found everything I was looking in the Armstrong TimberBrushed line. The color we choose was deep etched Hampton Brown. (Because we have a raised slab foundation, we went with a engineered hardwood floor). 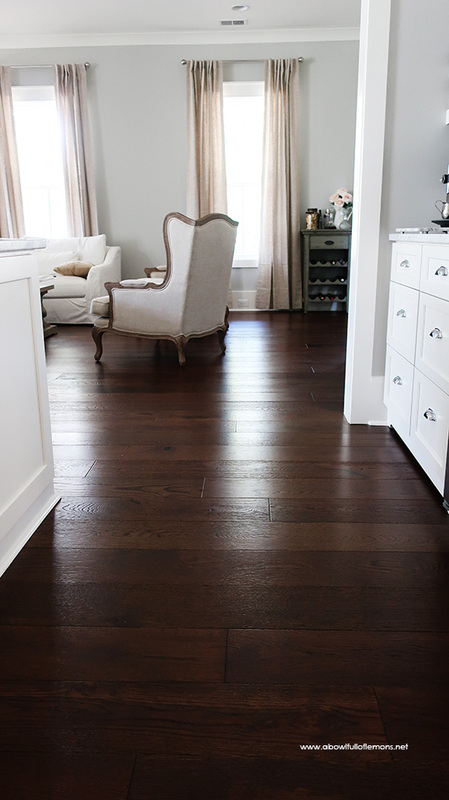 We had the Armstrong Flooring installed in all rooms of our home except for the laundry room and bathrooms. 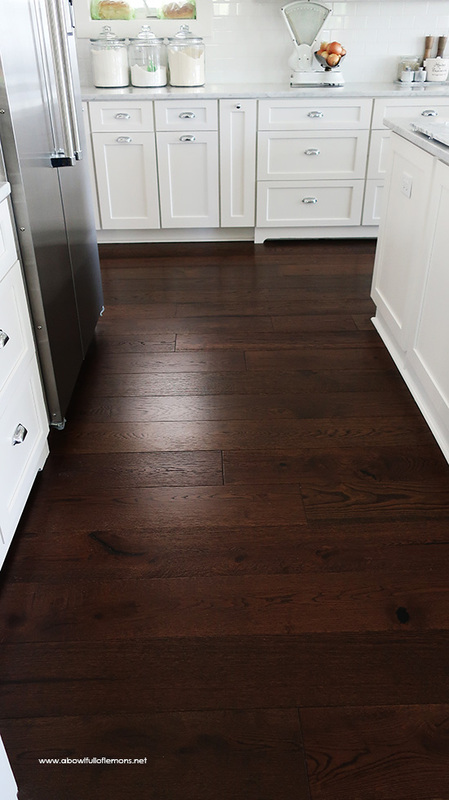 The TimberBrushed flooring has a brushed wood texture. The soft portion of the wood is gently brushed away, exposing the grain and drawing attention to natural knots, filled splits and lively grain patterns. The color in the photos shows it to be a little more “red” than the flooring really is. In person, it has more brown tones to it. Every angle shows its’ beauty. 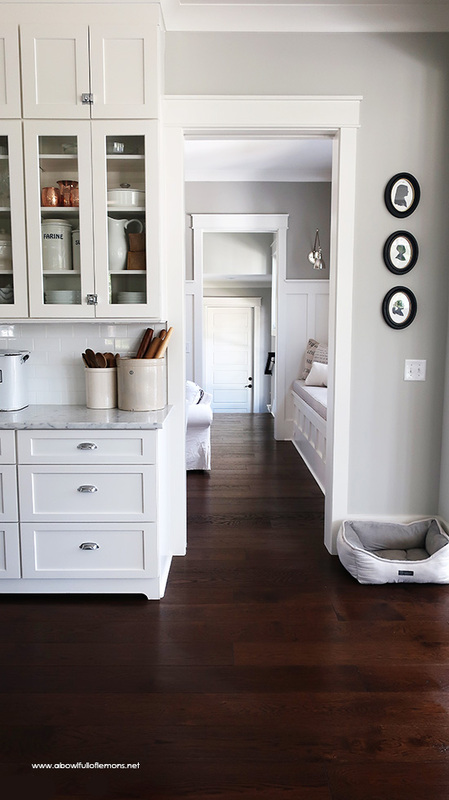 This color looks so timeless against the creamy white cabinetry. We stained the banister and stairs a couple shades darker so the flooring would stand out. Just look at that gorgeous wood grain! Did you notice that we changed direction of the flooring from the foyer to the living room? It gives the flooring more depth. 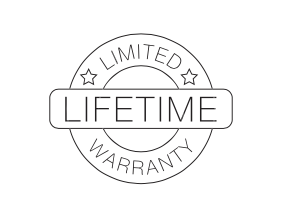 One of the reasons we went with Armstrong Flooring is because it’s backed by a lifetime limited warranty and protected by a lifetime finish for scratch, stain and wear resistance that keeps floors looking newer, longer. I love that! So far, after two months in the house, there are no scratches! We have three pets, so that says a lot! As I said before, working with Armstrong Flooring has been such a pleasure. Everything went smoothly and the finished project turned out so much more beautiful than I ever envisioned. 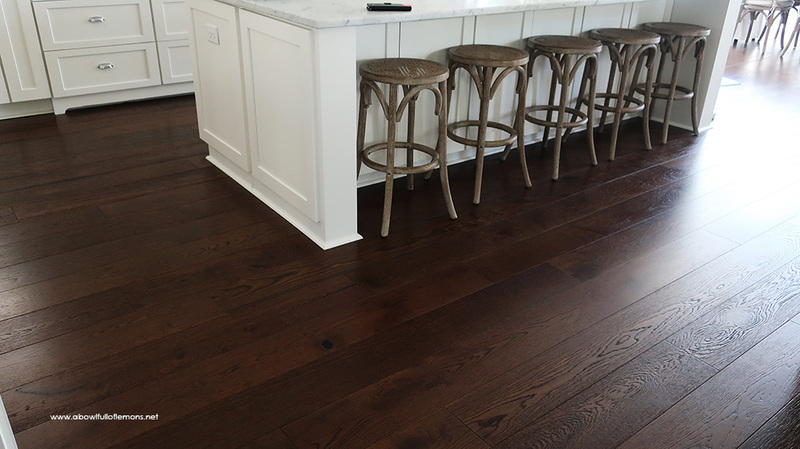 Be sure to check out Armstrong Flooring for your next flooring project. You will not be disappointed.